Home » Prague eBook – A Local’s Guide to the City of 100 Spires! Prague eBook – A Local’s Guide to the City of 100 Spires! Our ebook Prague: A Local’s Guide to the City of 100 Spires! is almost ready to launch! In the summer of 2014 we visited Prague for the very first time. We fell in love instantly, and leaving after two weeks was hard to do. We vowed to return the following year to spend a month getting to know the city and the country better. And so we returned as planned, and one month turned into six. Six months turned into a year and suddenly we found ourselves actually living in Prague! We decided we loved Prague so much that we made it our home base for other travels. During our time here we dove headfirst into local life in Prague. We have also explored every region of the Czech Republic have worked extensively with the national tourism board, Czech Tourism, to promote both Prague and other destinations in the country. And best of all, during that time we have consumed many a delicious Czech beer! We hope our experiences here help YOU make the most out of your visit to Prague and the Czech Republic, and we hope you fall in love as deeply with this place as we have! Our new ebook includes 140+ pages of information with everything you need to know about visiting Prague. From the top things to do in the city, to off the beaten path destinations, the best restaurants, where to stay in Prague on any budget, and much much more! This ebook is the ultimate guide to all things Prague, written by locals. Get Notified the Moment It’s Ready to Order! The Prague: A Local’s Guide to the City of 100 Spires! is almost ready to order. Sign up below and we’ll email you the second it’s ready. 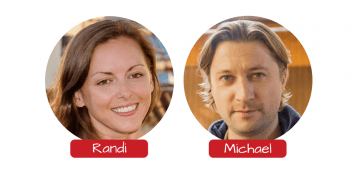 We’re Randi and Michael – two friends from NYC who decided to embark on a multi-year journey throughout Central America, Europe, and Asia in 2014. We created this site, Just a Pack, to inspire others to travel long term and give them the information and tools to do so no matter how big or small their budget. Just a Pack is a responsible travel site dedicated to promoting organizations and efforts around the globe that are committed to giving back and making a difference in their local communities.